The Apple iPad ( ) may be this spring’s most talked about touch-sensitive device, but for digital artists, the Wacom Cintiq 21UX interactive pen display still holds the title of top tablet. Thanks to a recent redesign, the 22-inch Cintiq now offers twice the pressure sensitivity of its predecessor, two strategically repositioned Touch Strips, and 16 programmable ExpressKeys that enable you to customize the tablet to fit your work style. Traditional graphics tablets require you to sketch on one surface and watch as the results appear on the monitor on the other side of your desk. This approach can be tricky to master. 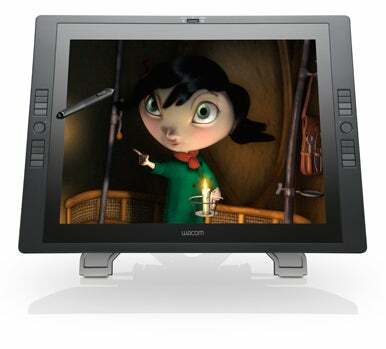 With the Cintiq, you draw directly on the built-in monitor screen. Even better, depending on the software brush you select, you can achieve different artistic effects. Push harder and your stroke darkens. Tilt the pen for a broader line. The new Cintiq 21UX utilizes Wacom’s second-generation sensor (already incorporated into its Intuos 4 product line) to offer an impressive 2048 levels of pressure sensitivity. Couple the Cintiq with a capable graphics program such as Adobe Photoshop ( ) or Corel Painter ( ) and you can achieve very nuanced, organic-looking illustrations without giving up the flexibility of working in the digital realm. The updated pen is about the thickness of a Sharpie and features a soft rubber grip that makes it very comfortable to hold. Beneath your index finger is a programmable rocker switch that you can use to right-click or double-click as you point with the pen’s nib. There’s even an eraser on the other end of the pen for quickly cleaning up stray scribbles. One-time pen calibration took less than 30 seconds. Once calibrated, the pen tracked remarkably accurately, even at the very edges of the working area where some tablets fail. As with its previous incarnation, the updated Cintiq incorporates two touch sensitive strips that allow you to quickly zoom, scroll, change brush size, or rotate the canvas just by dragging you fingertip. In the redesign, these Touch Strips are relocated to the back side of the unit to avoid accidental activation while sketching. The specific Touch Strip function is designated by using one of the two round toggle buttons on the front of the unit. Also included are 16 programmable ExpressKeys–symmetrically located, of course, so that the unit can be used just as easily use by lefties as righties. The Cintiq boasts an admirable 1600-by-1200-pixel resolution, 21.3-inch TFT display (measured diagonally). For those accustomed to the ubiquitous widescreen monitor, the Cintiq’s 4:3 aspect ratio may seem like a bit of a throwback, but it makes the physical geometry of rotating the monitor from portrait to landscape much easier. Apple Cinema Display users might notice that the Cintiq is not quite as bright (200 cd/m2 vs. Apple’s 330 cd/m2). The included display stand allows the tablet to be adjusted from a near-horizontal 10-degree incline to a maximum of 65 degrees. Removing the tablet from the stand is a cinch, but given the unit’s size I found it best to leave it be. There’s a reason they don’t call it “Thintiq.” At just under two inches thick and 19 pounds (without the stand), Steve Jobs would need to spend a lot of time in the gym in order to wave this tablet around onstage one-handed. And although the unit elegantly integrates its video, data, and power connections into a single six-foot cable, the half-inch-thick cord is a bit unwieldy for stand-free, casual operation. Current Cintiq owners looking to upgrade to a less cumbersome model will have to wait. Wacom’s Cintiq 21UX interactive pen display is a dream tool for electronic artists looking to expand their digital palettes. But with a $2,000 price tag and a weight of nearly 23 pounds, many will find it too costly or too bulky to meet their needs.